Greetings dear visitor! In some way or another, you have managed to stumble upon Conundrum, a one page tribute to one of the best books I've come across, Gods go Begging by the ingenious Alfredo Véa. The purpose of this page is to ( hopefully ) provide a review of this book in hopes of ~influencing~ readers out there to take a peek into this compelling tale. Please be advised that there might be some unmarked spoilers lying underneath this page. Conundrum is part of the Summer of Shrines event over at Amassment. You are currently viewing version 1 of Conundrum. The current theme is optimized for viewers with a 1024x600 resolution ( though I suppose 800x600 would be okay, too xD;; ). Despite this short journey, I do hope you enjoy your stay! If you need anything, please don't hesitate to contact me here. a bit of background: Author of two previous novels, La Maravilla and The Silver Cloud Cafe, Alfredo Véa of Yaqui and Mexican heritage was born and raised in Arizona where he lived his life as a migrant farm worker before being dispatched to Vietnam. When he was discharged, Véa worked several jobs ( from truck driver to carnival mechanic ) in order for him to attend law school. He is now working as a criminal defense attorney and currently lives in San Francisco. Véa won the 1999 Bay Area Book Reviewers' Award for Fiction and Gods go Begging was also dubbed as "one of the Best Books of 1999" by to the Los Angeles Times. ♥shinju's blurb: Véa has the ability to incorporate a touch of "enchantment" through his writing ( what others call as "magic realism" ) - no matter what scenario he portrays - light or heavy, life or death, he's able to charm readers and further whisked them deeper into the story. His artistic use of words paints a very vivid image in one's mind. I especially love his diction usage as he effortlessly manipulate words, placing them in an order that seems flawless. His writing is really inspirational ( there's always a smile plastered on my face whenever I re-read lines from the book ) and motivating. Although, at the same time, it's also intimidating, for me xD;; - what does it take one to write like that? To unwind death's grasp. To fundamentally tick and live wholly. To escape the cement barricade encased by war that rendered one incapable of living and loving. To inhale and consume beauty. To taste life's flavors. To be able to touch and feel. To start anew and refuel one's "life gauge." All this and more is what God's Go Begging present. The story takes place in present day San Francisco where Vietnam War veteran Jesse Pasadoble is still besieged by his terrifying recollections of war. Even if two decades already passed, his encounter at the unforgettable Laotian border continues to torment him as each day starts and ends. To add more to his already afflicted soul, combat still persists in the streets of Portrero Hill - the root of his new case - and in the fiery courtrooms where "justice" is served. Jesse must confront his nightmares as he probes deeper into the heart of it all, learning all the while that in order to obtain the truth, he must sew pieces of his memories - those grim moments dripping with crimson blood and suffocating thick smoke - together with the young man accused of double murder for they have an uncanny connection with one another that might just decode the puzzle at hand. Gods go Begging delves into the outlook of soldiers who have lost their "souls" in war and was rendered incapable of having "emotions." How they cope after the battle ends and their plight to salvation. Aside the "war" factor, Gods go Begging is more than just a war novel as it also entails a fusion of murder mystery, dramatic fiction, and court drama that is sure to keep readers entertained. 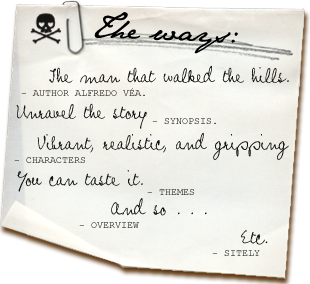 Despite being a fiction novel, Véa's characters are very tangible. From the fleeting appearance of the tiniest characters, to major ones, Véa gives each and every one of them distinct voices. No one is the identical. Below are the some of the ( major ) characters that are crucial to the story. jesse pasadoble • The main protagonist in the story. A Vietnam War veteran living in San Francisco, Pasadoble works his days as a criminal defense attorney and now continues to battle for justice in the fierce courtrooms. Despite being lucky in surviving the terrible battle two decades ago with his limbs intact, he lost his "ability to give or receive love" - the very thing that hinders him from really living. His past of his comrades on the hill on the is unknowingly linked with the recent killing of two women. Jesse is like the walking dead. He may be breathing but his essence have been preserved on the hills. His memories of war continue to torment him and it isn't until the end - solving the mystery of the Amazon Luncheonette killing - that is he able to relinquish war's vice grip. ♥shinju's blurb: An intellect, the one factor that I found both peculiar and amusing ( and I suppose admirable since I wouldn't have ~thought~ any of it ) is his "supposing" game - speculations of "ifs" during his time in the war. I find that Jesse is a stand in for Véa himself which makes me it more fascinating to read for it feels like I'm able to delve into his own personal life. The strings of his tale somehow makes the readers touch a piece of his life's account. "padre" • The young chaplain years back in the war. His naiveté of outlook on life, his cowardice and his inability to hardened himself cost him to "lose" himself into the jungles of Nam. At that time, he learns from a sergeant that once he's been there (war), nothing would ever be the same if he were to survive and come back home. He's an essential character that serves as one of the keys to solving the case. ♥shinju's blurb: I really feel for the padre despite appearing like a "coward" to others. Here was a young man who believed that all his life has been nothing but a "lie," smack-dabbed in a foreign terrain where his job is to send limb-less, sanguine liquid oozing bodies to a "better place." For someone who already has a frail soul to see the fluid insides of youth everyday, to find an "ecstasy beyond expression and beyond measure" for simply surviving, evading death's touch, it's not difficult to lose one's self. After all, a person can only take in so much. biscuit boy (calvin thibault) • The young man accused of the double murder of Persephone Flyer and Mai Androng. Because of his lack of education, authorities forced him to profess a confession for the crime he did not commit. Because of fear, he's unable to speak the truth behind that fateful night. Jesse becomes his appointed lawyer and through his help, not only acquire more knowledge and beneficial skills ( reading & writing ) but also survive the prejudiced courtroom. mai and persephone • The women who strive to break the "code" of their significant other. The ones who knew that they could not prevent their men from leaving. The ones who understood that "desire is the essence of war." They are the ones whose feet stand firm on the grounds, hearts strong as ever, hoping and yearning to touch their lovers' souls once more. The novel portrays the system in which soldiers lose their humanity and in turn become cold as ice, hard as stone. Gods Go Begging illustrate how these once mighty soldiers dwell with their Post-Traumatic Syndrome subsequent the war period and how it affects their surroundings as well as loved ones. The story exhibits the war commanding-action system: government declares war, military officials send the orders, and lastly the soldiers follow the given orders. Government easily declares war and yet they are unaware of the atrocities the soldiers face as well as the innocent lives involved in the battleground. Youth are disenchanted with the guise of power, fame, and "sexual" license, thus signing their death sentences so easily. Yet once they inhale the stench and witness themselves the horror they have given themselves in, they instantly regret, and desperately fight for their survival. Racism and injustice heavily rings in Gods Go Begging. "The simple idea of cultural difference as blasphemy is the very foundation of American racism." Jesse's group that consisted of a mix of various ethnicities on that hill were merely a divergence in order for the "whites" to be preserved. Calvin stands little chance of proving himself innocent in front of white, prejudiced jurors most especially if he's unable to speak the "languge" these folks speak. Gods go Begging is a book about "communication." The women try to end their husband's perverse desire with "violence." The battle in Vietnam took place on a "cryptographic relay station," where the Vietcong tried to decipher the codes. The army that enticed youth obstruct them from affections. Calvin is saved because he was taught language. War is “wrong,” “it’s bad,” “it doesn’t help anyone or fix anything,” are the commonly phrases I hear when we have class discussions about warfare. I also reply along those lines, not knowing the depths – the ropes of atrocities that signs off soldiers and innocents lives to its end. The title was the one that piqued my interest in 11th grade (2008) while I was tying to decide which book from the list I should read. Since when do gods even beg, right? I was instantly hooked from reading the synopsis and soon enough, was sold right there and then by the very start of the first chapter. In a perverted sense, my attention was immediately captured because of death's guise for a mere second: a fleeting beauty. Though I suppose that the very paragraph does entail beautiful's death - the demise of two beautiful, loving souls people. To date, I've read four war novels: Johnny Got His Gun (8th gr. ), A Farewell to Arms (10th gr. ), Gods Go Begging (11th gr. ), and lastly, Ambush Alley (12th gr.). But amongst the four, Gods Go Begging rings the loudest for it's the only account ( among the four ) that not only gives the soldiers' narrative and their families, but also the chronicles of both the opposing side and their families. That the so-called "enemies" were not simply things to be exterminated - they're humans that they also strive for the best, live, and most of all love. That admiration can exist for foes. And what the other 3 did not present, opposing sides finding similarities with one another, thus becoming friends. And if one looks closely, they can find that there are lessons to be learned from both parties. One of the things I really enjoyed in GGB, is the fact that Véa draws parallels between the Vietnam War and today's gang wars. When we think of war, the first thought that arises are strife between countries. To others, gang wars are ever so ordinary that they simply dismiss it. However, such types of conflict is just the same as the ones in the army. That these young men - "soldiers" are disillusioned by a certain promise - fame, women, or the pretense of being a "hero." That the conflict is simply because of territorial ( in terms of the soldiers fighting ). Women are the "core and central power" in Gods Go Begging, a feat I have yet to come across in war novels. Here are young men seduced by uniform because of it's promise of "sexual license" and expertise as they have seen so many times in movies - young man winning the affections of the maiden for winning the duel. The "perversion" of desire that characterizes valiance as a "sports prowess, military prowess." Yet, what women really want is something really simple: to converse about emotions with their significant other - a deed that seems difficult for those who have come back. Véa said that by writing, "I seem to be able to work things out; to get to the core of it" as he was also one of those who were unable to speak of "emotions." Gods go Begging is a superb book packed with variant elements that will capture the reader's attention from beginning until the end. I enjoyed how everything right from the start ties with the ending flawlessly.♥ Though I'm honestly still somewhat lost about the last page to be exact because it implements their "supposing game," lol. My initial drive to create Conundrum ( besides realizing that my original idea for the marathon could be expanded ) is to compensate for a book review I wrote last year (2008) for Journalism, xD; I felt that I left various points that should have been pointed out and I sincerely wanted to re-write. But alas! It wasn't possible, ahaha. And so, this is my little corner to express my ~love~ for this book. 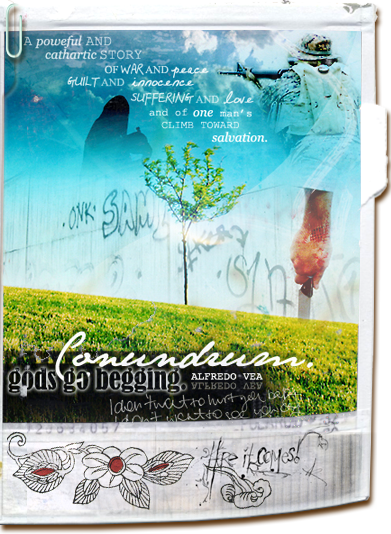 ♥ Conundrum is part of the Summer of Shrines event over at Amassment. theme: You are currently viewing version 1 of Conundrum titled Busy days. All stocks to create the Gods Go Begging ~poster~ were found at stock.xchng. Postcard + pen icon was found at iconlook. Wood background is from j-owen, textures were from gender, lifeisdolce, yunhe & more here. Arial Black, Courier New, CuttyFrutty, Georgia, Mumsies, Tahoma, and Times New Roman are the fonts that were used. The programs that were used to create Conundrum are Photoshop CS 3, Textmate ( coding ), and Cyberduck ( ftp ).